Operating long past its original mission of 90 Martian solar days – also known as “sols” – NASA‘s Opportunity rover has survived another passage through the deepest part of the Martian winter. Drawing on years of experience, operators positioned the stalwart robot on a northward-facing incline to give Opportunity‘s solar panels the best chance of generating enough electricity to survive the Martian winter. An artist’s concept portrays a NASA Mars Exploration Rover on the surface of Mars. Two rovers were launched in 2003 and arrived at sites on Mars in January 2004. Each rover was built to have the mobility and toolkit for functioning as a robotic geologist. Image & Caption Credit: NASA / JPL / Cornell Univ. With days beginning to lengthen as Mars’s southern hemisphere crawls into spring, NASA’s Jet Propulsion Laboratory (JPL) feels confident the rover is well-positioned to make it through the rest of the season. “Now, Opportunity has made it through the worst part of its eighth Martian winter,” noted Jennifer Herman, power subsystem operations team lead for Opportunity, in a release issued by the agency. Ensuring the rover’s solar panels can supply enough power to maintain the hibernating explorer involves more than simply parking the rover in the open. With the Sun passing across the northern sky, positioning Opportunity with its panels facing north was critical to surviving another winter. 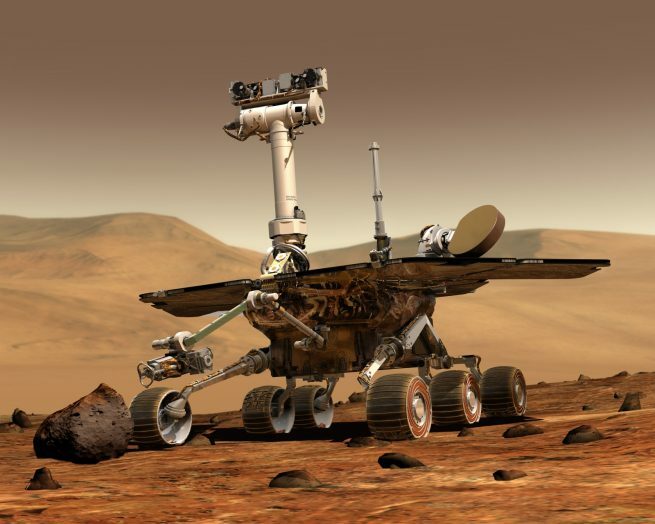 Indeed, when Opportunity‘s twin, Spirit, lost the use of two of its wheels, operators were unable to maneuver it to a suitable location in 2009 and the rover was unable to survive the season. Rover operators painstakingly plan Opportunity’s movements to assure the vehicle will be able to be oriented for maximum power generation. Operators call these advantageous locations “lily pads”. Proper solar panel orientation is only one of the challenges of keeping Opportunity functioning. Orienting the panels to face the Sun does little if the panels are covered in dust. Though Mars’ atmosphere is thin, the Red Planet is notorious for its planet-girdling dust storms. The storms, which can last for months, not only dim the amount of sunlight reaching the surface but also they also deposit power-robbing dust on the rover’s solar panels. In fact, Opportunity entered hibernation its panels at near record-levels of dust coverage. Luckily, Opportunity has been the beneficiary of occasional winds that serve to clean dust from the vehicle’s solar panels. “We were worried that the dust accumulation this winter would be similar to some of the worst winters we’ve had, and that we might come out of the winter with a very dusty array, but we’ve had some recent dust cleaning that was nice to see,” Herman noted. As the Sun inches higher into the sky, scientists look forward to the rover continuing its examination of Perseverance Valley. Unfortunately, some of the most valuable information is most likely located on the valley floor. “We have not been seeing anything screamingly diagnostic, in the valley itself, about how much water was involved in the flow,” said Matt Golombek, Opportunity Project Scientist at JPL, in the release. Though the rover has operated longer than anyone imagined, it will no doubt succumb to Mars’ harsh environment at some point. Until such time, scientists plan to use sound judgment when planning the intrepid explorer’s journey. “We may get good diagnostic clues from the deposits at the bottom of the valley, but we don’t want to be there yet because that’s level ground with no more lily pads,” concluded Golombek.